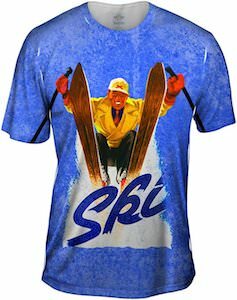 If you like skiing and cool vintage looking t-shirts then this is the ski t-shirt you want. The t-shirt shows the same image on both the front and the back and it takes up the whole fabric of the shirt. On the shirt, you can see a vintage looking skier and the word ski below him like he is jumping over it. It all has a look of a vintage winter sports poster and that makes it really cool and unique. You can get this ski t-shirt in men’s sizes XSmall – 4XL and all are made from 95% polyester and 5% spandex for the perfect fit and feel.